I've been a part of the Trust Circle of do.Good.Stitches, a charitable quilting bee, for some time now and in September of last year, I was charged with gathering blocks and putting together a quilt on behalf of our group. While I realize it is March 2nd, nearly 5 months after I received the blocks...the quilt is done and awfully pretty, wouldn't you agree? 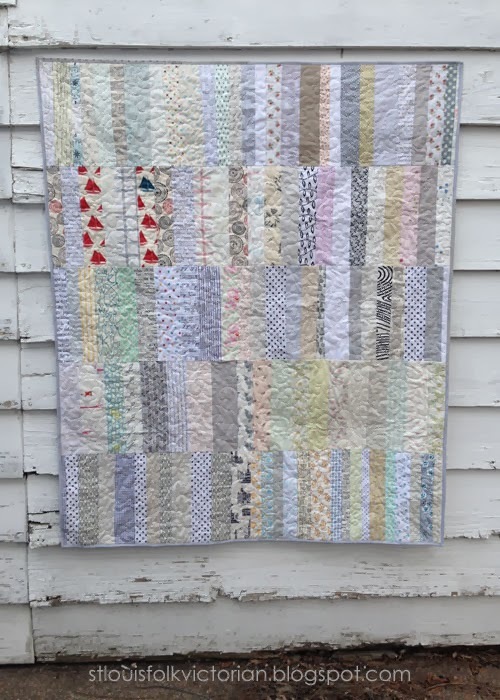 Inspired by this quilt by Lulu Bloom, which I adore for it's simplicity, I asked my fellow bee members to create one rectangular block measuring 12" x 24" long. 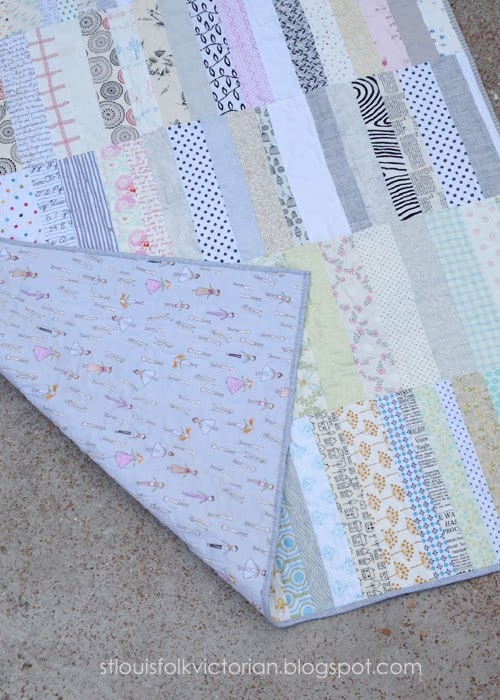 The blocks were to be made using strips of low-volume fabrics, prints or solids. I chose to use Crafty Chloe "Pin People" print by Heather Ross for the backing; which compliments the soft overall feel of the quilt. This quilt measures approx. 48" x 60" and is quilted in a meandering stipple formation. After taking a swim in the washing machine and a tumble in the dryer...it will be donated to a local charitable organization, where I hope it will make someone smile. Thanks Trust Circle for your help, I couldn't have done this without you. It looks great, Kristy. The backing is perfect, and I love the sneaky splash of red on the front. Very pretty. Bee quilts are the best. I adore the backing! Very pretty, it's amazing how so many different people can create independently and then come together cohesively. The lone pop of red looks perfect and I love the HR on the back. This is lovely. The perfect colours for a little baby. I adore that backing fabric too!